A Broad Spectrum Hard Surface Cleaner/Disinfectant For Professional And Home Use: Our high potency hard surface cleaner/disinfectant, Microcide SQ®, can be used for all your disinfecting needs. Sanitize dishes, laundry, floors and, of course, kitchen and bathroom surfaces. 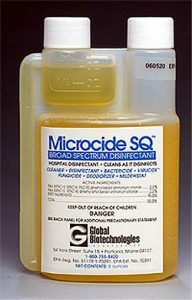 Microcide SQ® is a one-step, 2 ounce per gallon concentrate. It is a broad spectrum hospital grade disinfectant, deodorizer, residual laundry additive and high potency hard surface disinfectant with EPA approved efficacy claims for over 130 organisms. It is also EPA approved for use as a food and non-food contact sanitizer. Microcide SQ® is approved as carpet sanitizer against odor producing bacteria and also as a laundry additive with residual activity. Microcide SQ® helps meet all OSHA and Federal regulations for bloodborne pathogens and will kill the HIV (AIDS), HBV (Hepatitis B) and HCV (Hepatitis C) viruses with the appropriate contact time. Microcide SQ® is active in the presence of 5% serum and 400 PPM hard water. Microcide SQ® is stipulated by many manufacturers of analyzers, hoods, incubators, centrifuges as well as other equipment to maintain its warranty status or recommended as a safe, non-corrosive disinfectant to protect the internal parts of the instrument.